I learned so much today! And not just about the regions of the United States. I was once again pleasantly surprised by the power of children constructing their own knowledge. In fact, I’d love to continue experiencing content in the content areas in this manner. My lessons today and Friday have been centered on learning about the important land features, bodies of water, industries, historical events, and natural resources in the Northeast, and the way I decided to teach it (which was quite a risk, in my eyes) has completely changed my perspective on teaching social studies. This series of lessons, of course, had to start with a rubric, which my team and I constructed before starting to plan any part of the unit. 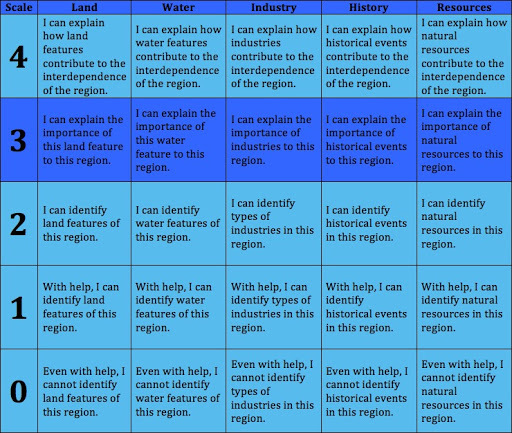 The rubric is to the left, and it requires kids to be able to explain the importance of different features (i.e., land, water, natural resources, industry, history) within a region. This rubric will be used for each region, and we will assess them in the same manner, only with different features within each region. After I introduced the region to the kids, we began with a state of my choosing. I chose Delaware because it is, very appropriately, the first state admitted to the Union. That at least seemed like a good talking point at the time. The kids seemed to like it, too. While I had to giggle a bit at this interesting fact, I felt the need to review determining importance as well as setting a purpose for our reading. Since we developed a good base in this earlier in the year, it was a rather quick review, and I’ve found it to gradually improve throughout this process. We all are naturally drawn to these interesting, but unimportant facts, but by having a guiding question, key words posted, and the rubric in which the whole activity is grounded, I was able to seamlessly and purposefully redirect the kids to the important facts at hand. Once we surpassed that minor speed bump, the kids got to work on their own. 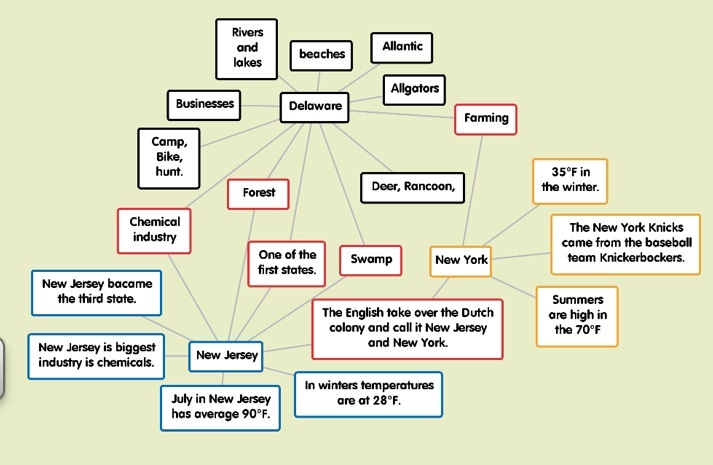 They began to find out a variety of interesting and relevant facts independently, finding out that Deleware borders the Atlantic ocean, has swamps and beaches, is home to lots of businesses, offers its residents lower taxes, was once a Dutch colony until it was taken over by the English, and provides the country with milk, crops, fish and chemicals. Some of these things I didn’t even know! Some still had trouble pulling out the important facts, and at times, I felt plagued by questions about seemingly irrelevant facts. It’s just like anything else, though; some just take a little bit longer to truly understand. At the end of the lesson on Friday, I assigned the remainder of the activity for homework over the weekend. At that point, I felt it had been well-scaffolded enough to where they could finish pulling out the facts on their own. However, I did decide to preview the next phase of the activity, in an effort to provide a “vision” for the rest of the project. I talked to them about “collecting dots” versus “connecting dots.” At this phase in the activity, we had been collecting dots, and now we would begin connecting them in order to develop a general idea of the important aspects of the region. Facts, in isolation, are rather useless, but facts in context provide much more relevance and importance. Today, we were able to begin the second phase. 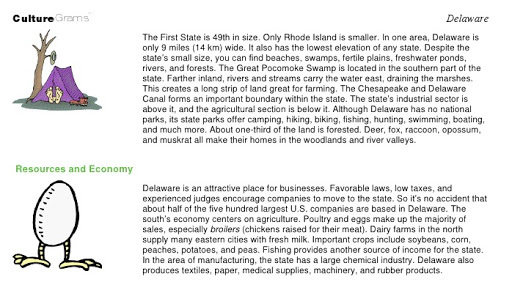 The second phase of this activity required the kids to research a second state, but before we did that, I wanted to review our study of Delaware. 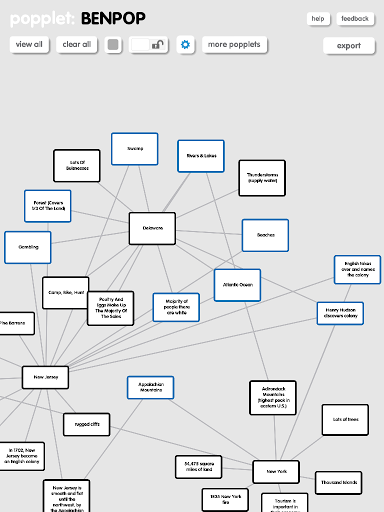 I had a few children share their Popplets on the big screen, to see what other facts they found important, and also to see what they left out. One of my students, in particular, included the fact that Delaware has some of the lowest taxes in the country. Many of my students automatically deemed this fact “unimportant.” In order to help them begin to connect some dots, I had them discuss why they deemed it unimportant or important. I made sure not to give my opinion in an effort to avoid swaying their decisions. They seemed to be rather divided, so I had one of my kids who decided the fact was unimportant share his thinking. He stated that it did not affect the land, water, resources, industry, or history of the region, in so many words. My other student, the one who created the Popplet, immediately rebutted. “Well, it kind of does affect the industry, because if people pay lower taxes, then there might be more businesses,” said this other student. They debated, very respectfully, for about a minute, and I truly wish I could have recorded it, but the end result of the process was that the student who originally deemed the fact as unimportant decided that it was, in fact, important due to the fact that business come for lower taxes and that it will affect how much people will spend, which will, in turn affect how many people want to live there. This was the first time in the class period where the kids literally connected the dots on their own. I provided little to no support, other than moderating the conversation. Eyebrows raised, mutters of new thought and agreement seemed to fill the room, and the inquisitive process began to simmer. …and they’re not even done yet! Today, I once again, truly saw the power of children constructing their own knowledge. The information became that much more relevant, their passion that much more palpable, and while it remains to be seen, I’m sure that these experiences will help them to make even more connections in the future, making for a more interconnected and cohesive experience. Prev Do "Pretty" Teachers Get More Respect?